The Zeiss Supra 55VP SEM is a high resolution Field Emission Scanning Electron Microscopes (FESEM) with a Schottky source. Its high efficiency in-lens detector produces exceptional quality scanning electron images down to 0.1kV and BSE, Everhart-Thornley SE and VPSE detectors may also be used for imaging. 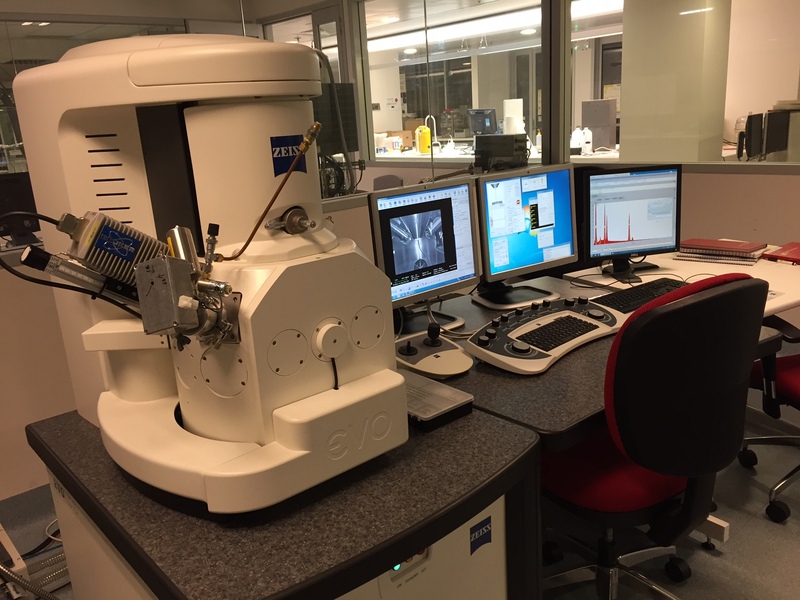 An Oxford EDS system is also available for elemental characterisation as is an Oxford Electron Backscatter Diffraction (EBSD) system for crystal orientation analysis and mapping. 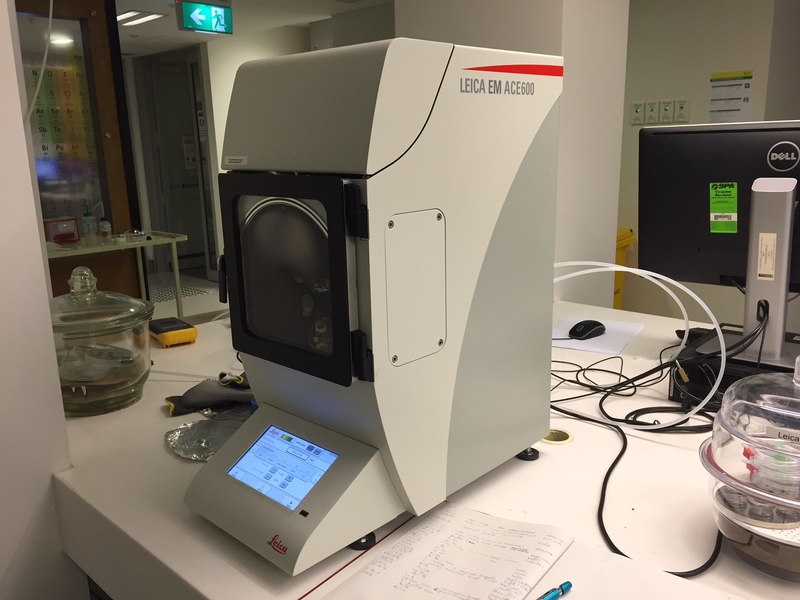 The Zeiss Evo LS15 is a life science themed thermionic tungsten electron gun Scanning Electron Microscope which is used for imaging features on the micron scale. The pressure range is 10 - 3000 Pa (air or water vapour) and it is equipped with a Peltier-colled Carl Zeiss coolstage that can control temperatures down to -25°C. 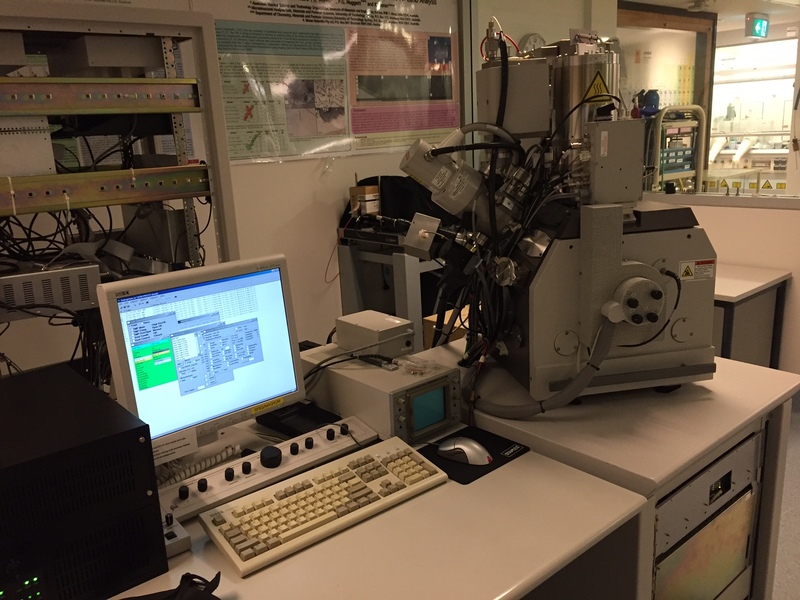 This SEM is also equipped with a Bruker SDD XFlash 5030 detector which allows high speed elemental analysis and mapping. A gunshot residue (GSR) analysis system is also available. 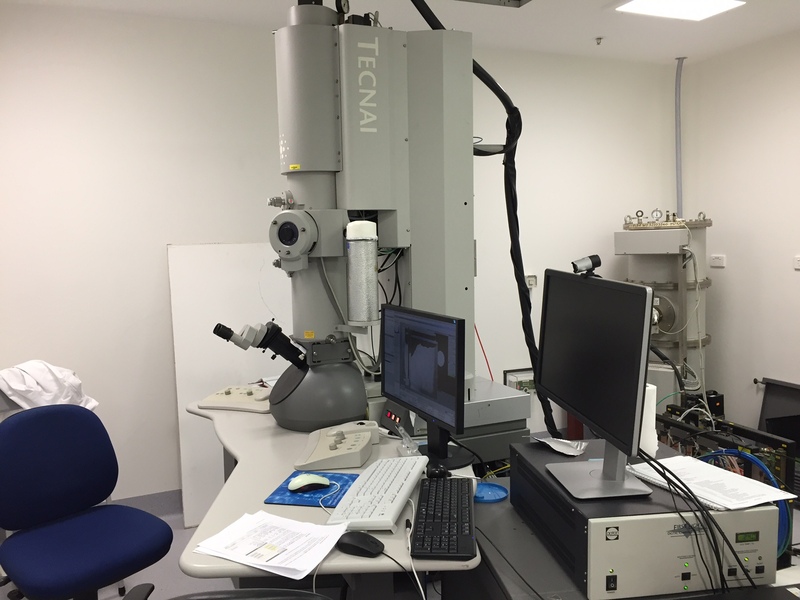 The FEI Quanta 200 Environmental Scanning Electron Microscope (ESEM) is a thermal tungsten gun instrument capable of imaging under three vacuum regimes, High-vacuum (< 6e-4 Pa), Low-vacuum (10 - 130 Pa) and ESEM-vacuum (10 - 2600 Pa). The Quanta is equipped with several CCD detectors for high speed cathodoluminescence spectra aquisition. A Gatan C1002 liquid nitrogen cold stage is available for cooling samples to 80 K while a Gatan CF302 continuous flow liquid helium cold stage is available for cooling to 5 K. A Melles Griot HeCd 100 mW dual wavelength laser is available for simultaneous PL studies with excitation at 325 and 442 nm. The FEI Sirion SEM was donated to UTS by FEI in 2011 as part of a research project collaboration. It is dedicated to several research projects related to in-situ beam chemistry. 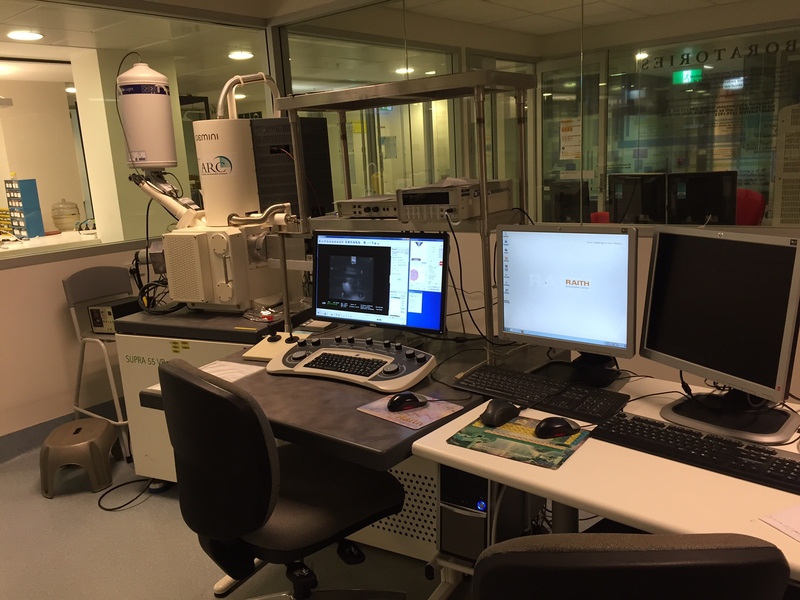 In an Environmental Scanning Electron Microscope (ESEM) all specimens, either wet or dry, conductive or insulating, can be examined in their natural state without the need for specimen preparation. In wet mode, specimens can be examined at pressures up to 2600 Pa (3nm resolution), in a variety of gaseous atmospheres and temperatures (-30°C to 1000°C). A unique application of ESEM is dynamic in-situ studies of surfaces during heating or freezing experiments in a variety of gaseous atmospheres and (de)hydration experiments. 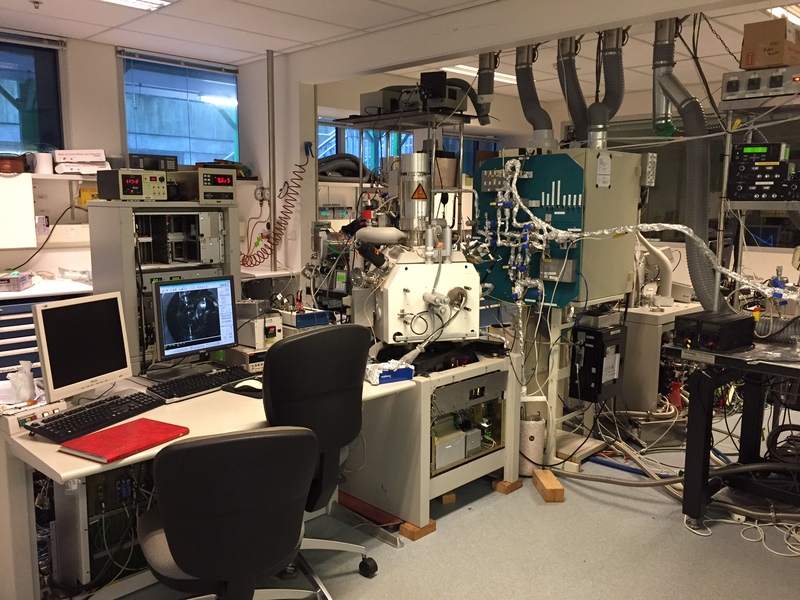 This microscope is dedicated to beam chemistry reactions. The FEI Dual Beam system is currently being commisioned. 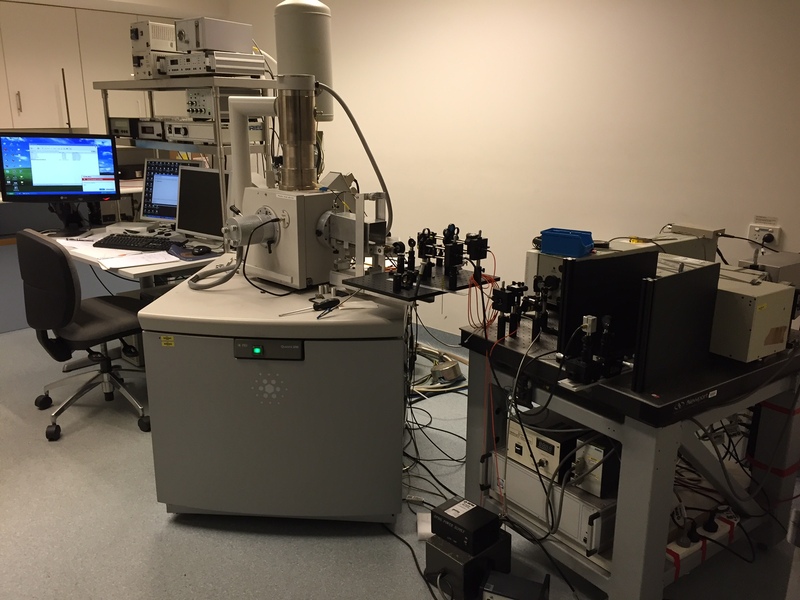 The Tecnai T20 is a 200kV TEM TWIN with both single and double-tilt holders that can be used for imaging of both materials and biological specimens as well as characterisation via electron diffraction. It is equipped with a Gatan 894 2k x 2k camera for high quality digital images. It can also be operated at 120kV. This high vacuum coater is equipped with both a carbon thread evaporation and metal deposition system. Carbon coating is used where a sample is being imaged in a high vacuum environment where EDS analysis will be performed, whereas a coating of Au/Pd is used for high resolution imaging. It also has glow discharge available for TEM grids or for specimen cleaning prior to coating. © Copyright UTS - CRICOS Provider No: 00099F - 24 January 2019 02:48 PM. The page is authorised by Deputy Vice-Chancellor and Vice-President (Corporate Services).